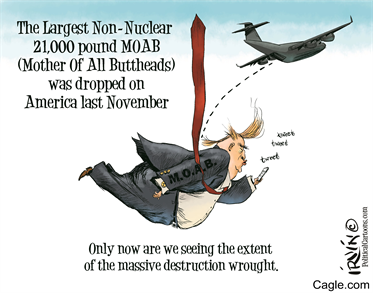 Wackydoodle sez: His bomb is bigger than Li'll Un's! *In the words of the Washington Post: "Since World War II, the United States has engaged in an almost unbroken chain of major and minor wars in distant and poorly understood countries. Yet for a meddlesome superpower that claims the democratic high ground, it can sometimes be shockingly incurious and self-absorbed. In the case of the bombing of North Korea, its people never really became conscious of a major war crime committed in their name." The Post article goes on to say: The bombing was long, leisurely and merciless, even by the assessment of America’s own leaders. “Over a period of three years or so, we killed off — what — 20 percent of the population,” Air Force Gen. Curtis LeMay, head of the Strategic Air Command during the Korean War, told the Office of Air Force History in 1984. Dean Rusk, a supporter of the war and later secretary of state, said the United States bombed “everything that moved in North Korea, every brick standing on top of another.” After running low on urban targets, U.S. bombers destroyed hydroelectric and irrigation dams in the later stages of the war, flooding farmland and destroying crops. Blue meanies, indeed!